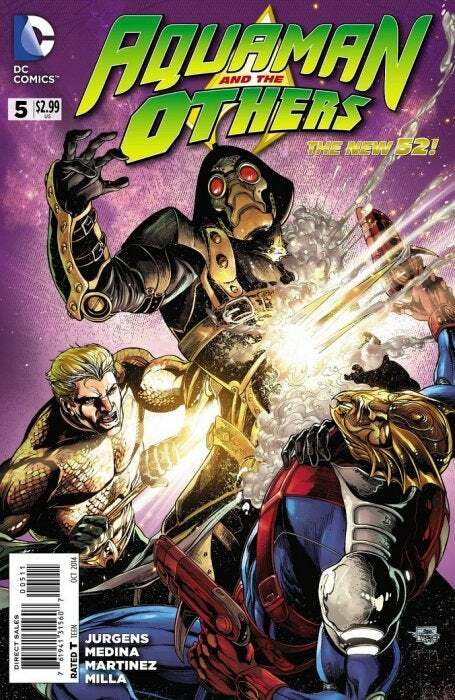 Exclusive: Talking With Dan Jurgens About Aquaman and The Others #5, Futures End and...Star-Lord? Earlier this week, Aquaman and the Others wrapped its first story arc, introducing two new (mostly) members of the team and a new status quo...which we won't have a chance to really explore until October, since next month's issue is a tie-in to the Futures End Month event in which the book will jump forward five years into a potential future of the DC Universe. 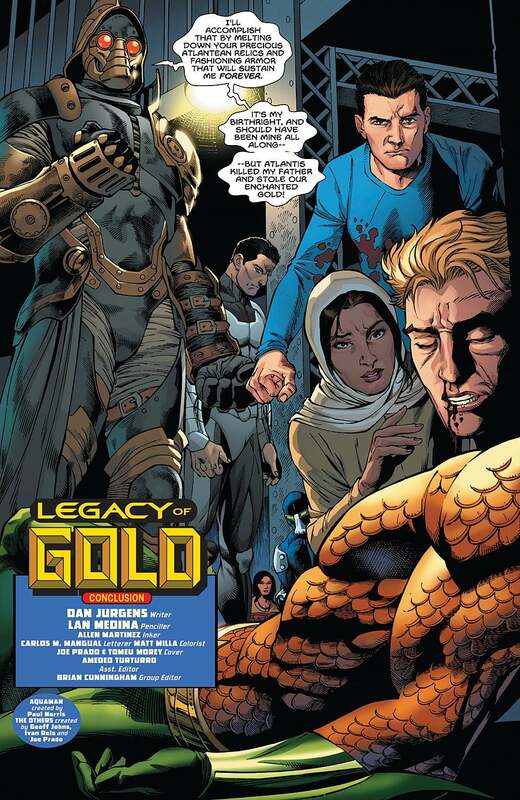 Series writer Dan Jurgens, of course, is one of the key writers on Futures End and so Aquaman and the Others is situated to be one of the more significant books of the month, and promises also touch a little bit on current events of the monthly comic where we are wondering whether Kahina's visions are or may be the way events will play out. Jurgens joined us to talk about Aquaman and the Others #5, the end of the arc and the future of the team. Reminder: These interviews are spoiler-heavy and if you haven't yet read Aquaman and the Others #5, drop what you're doing, go buy one and read along with us! We usually go (mostly) in order! This is kind of a classic story structure, in terms of the two "new" people (Vostok II and Kahina) coming to the rescue in the end. Was the idea always to give them a particular spotlight? Dan Jurgens: Yes. When I was first approached to do the book and started to really think about the group, I felt that, in general, the original construction of the team was best. Frankly, some of that was driven by the realization that none of the remaining group could fly, which I ended up using as a story element right away. More than that though, the team just seemed to function better with Vostok and Kahina. Bringing in a new group of villains in the flashback (the mystic woman who granted Legend his powers) begs the question: will we see more of that group's progeny, even if Legend is gone? I have a few ideas of where and how we might see them again. We'll see if I can work it in. All this said, Vostok II is certainly...unpredictable. When he removes the helmet, does he revert, or did he just need to make that first spiritual/phsyical contact? We'll be explaining more about that and exploring the nuances of what happened as we move forward. Stay tuned! This issue had a lot of "quick cuts," which is interesting because for the most part the team was together. Was that a creative choice, to make it feel like it was always moving, or did it just break down that way when you got the beats down? It was intentional. I wanted a lot of movement and intercutting of scenes to make the whole story feel like it was reading faster as the action was speeding up. I don't feel like you utilize double­page splashes as much as many writers/artists do. When do you decide is the right "moment" for one like you delivered this month? When we see someone like Vostok reappear, which is a stunning development for the characters who thought he was dead, a double pager is definitely called for. The idea is to get maximum impact out of the scene, which generally requires judicious use. Are these pools related in some way to Ra's al Ghul's Lazarus Pits? No, not as at all. 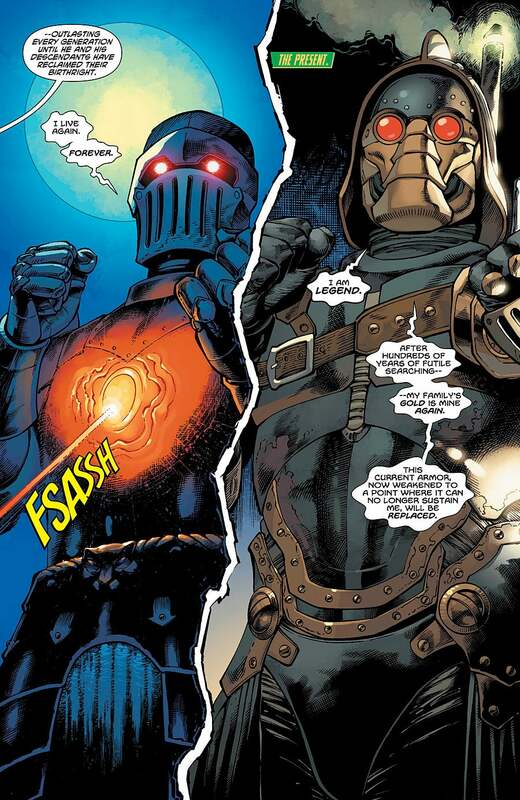 With character like The Operative, when do you decide to "pull the trigger," figuratively and literally, on letting him kill when he's on a team with more traditional hero­-characters? Given his past, it's safe to assume that the Operative has done more than his share of killing in the past. That's actually something we'll be dealing with as we move into the next storyline. Do you have a cheat sheet somewhere of all of Prisoner of War's ghostly companions and what they can do? Yes! I actually do­­ though I keep tweaking it just a bit. It has to be limited however. It's worth noting that we actually first saw the medic in Aquaman #9, page 9. Darya struck me as the most potentially damaging character here because she could do so much more at distance. Is it safe to say we'll hear from her again, seeing as she's the only one who could walk out of this fight under her own power? As I've said, I do hope to get back to them, particularly Darya, in the future. She had an edge to her personality that made her quite a lot of fun to write. Did it ever cross your mind during the writing that this resolution felt a bit like the old "You gotta get Aquaman wet or he'll DIE" device? What I wanted to do hear was get the other members of the team onto the main stage in a fairly major moment. 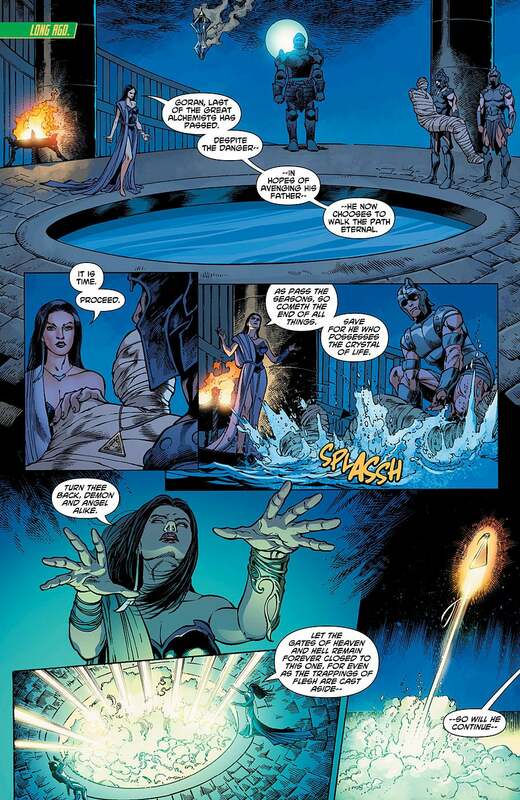 I'm guessing that Kahina's trepidation about the visions has to do with the Futures End thing she saw early on, no? How much will that play into the Five Years Later issue next month, which looks like it's more Arthur­centric? Once again, I have to dodge this a bit, as the whole question of Kahina and what she sees­­ whether it MAY come to pass or MUST come to pass­­ is going to be quite important. Do you feel an obligation to be a little more Arthur­-centric coming out of this arc, since he spent so much of it off the board? I do, yes. Not because he was off camera, but because he's a good character, the center of the team. I never really noticed until this issue when there was a certain image that reminded me of Star-­Lord, but Vostok's outfit looks like kind of a classic sci­fi hero look. What do you think ­­ did he steal J'Onn's suspenders? All of the Others are based on classic fictional archetypes. In Vostok's case, it's a Rocket Man sort of character, so there's certainly some commonality there.